Very nice RD. Lots of window for that much needed sun exposure. A split level built on a slope with the lower level lookout view I'm assuming? What is the top section, an upper level master bedroom perhaps? The mid west states really got hit hard with that cold spell. As RD said, it is downright dangerous to be caught outdoors for any length of time when temperatures and wind chill get that low. Lucky me was volunteered to help a family member move housing on Wednesday during -23° weather. A ton of fun that was. When the fingers go numb the best thing to slowly bring back the circulation is to put them in room temperature water. Toilet water is ideal for lessening the pain of thaw. I used to think I'd rather freeze to death than burn to death, but now I'm thinking otherwise. Thank you. The living room has 16 foot ceilings. The small windows are up there. This is what it looks like looking out the back on the upper floor. That's a south exposure. Looks like you have a water way on the back of the land. Every year here there are whey to many deaths on snowmobiles. The machines are so fast that the nuts operating them think they can cross open water for hundreds of yards. Quite often alcohol is involved and also the in the dark with no ice picks to help them out of the water when thier machine goes for a dip. The likelihood of surviving without picks or other safety measures is next to zero. Sadly many of these deaths are of experienced sledders and most often preventable. Yes, sort of. It is a kettle bog. It is the remains of an pond that has filled in over the last few thousand years. It is wet but it is never flowing. The house site is high on something called a paha ridge. It is a ridge that was built up during the last ice age when central Iowa was under a mile of ice. My part of Iowa was a dry tundra and huge drifts of soil and sand called loess were piled up by the 70 mph gravity driven winds coming off the ice. This bog is high on a ridge. It was probably caused by a huge chunk of permafrost left after the glaciers retreated and kept soft as a wallow for bison herds. In any case, I can see for miles in three directions from the house. Here is what it looks like from the frozen bog last month before snow fell. That is a large home RD, surely a good investment and a beautiful place for the golden years of retirement. Quite often see those monster homes in the country side and wonder about all that space. Space can be good at times when you want to hide from the spouse but thats a lot of square footage to heat. Interesting about the bog flow. Similar to the Ausable Cut that flows nowhere, just seems be dead water that goes from lake to nowhere. Very stagnant water but good for fishing and other wildlife. A bit too attractivve for mosquitos during the warm months. It's a large house but this is where my extended family gathers for holidays and events. This is ground zero for my family and my wife's family. Several times a year the house will be overflowing with people, cousins, nieces and nephews. It is heated with ground source geothermal. 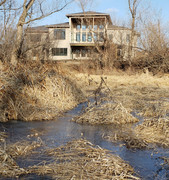 We have bored source loops under the wetland and use the wet earth to heat and cool the home. It is the most energy efficient way to heat and cool. The bog has an outlet and it drains 21 acres. The water is filtered through grasses and loess and is very clean. There will be mosquitoes but the framework you see on the back of the house is to screen in that porch to make it bug free.